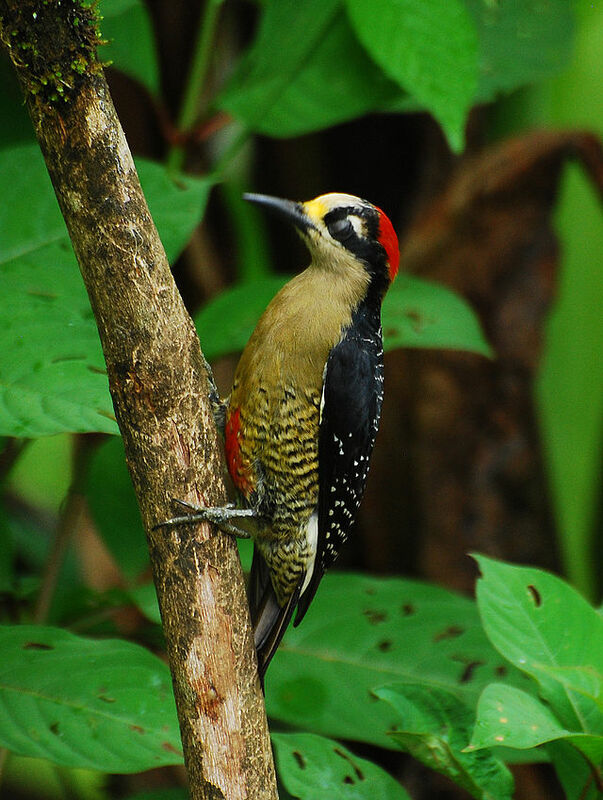 A specimen of SCP-2802 resembling a black-cheeked woodpecker (Melanerpes pucherani). Photograph taken 9/18/2008. Special Containment Procedures: Due to the massive population and widespread distribution of SCP-2802, complete containment is impossible. The Foundation has therefore decided to focus on observation, tracking, and destruction. A global contingent of Foundation field agents has been assigned to capture specimens belonging to the taxonomic subfamily Picinae and conduct medical examinations and scans in order to determine their status as non-anomalous Picinae or as specimens of SCP-2802. Captured specimens of non-anomalous Picinae are to be banded prior to release, while captured specimens of SCP-2802 are to be terminated. Any captured specimens of SCP-2802 that exhibit non-standard properties are to be tagged with miniature GPS trackers. All tagged specimens of SCP-2802 are to be monitored at all times from Area-22, and any changes in behavior or physiology from established norms is to be immediately reported to the current project administrator. Several captive specimens of SCP-2802 are to be contained in a large free-flight aviary at Area-22, and are also to be observed for changes in established behavior or physiology. All eggs produced by captive specimens of SCP-2802 are to be confiscated, and all hatchlings are to be hand-raised by properly trained personnel. Non-anomalous Picinae hatchlings are to be banded and released into the wild upon reaching maturity, while SCP-2802 hatchlings are to remain in containment. Following Incident 2802-1, all personnel tasked with directly handling specimens of SCP-2802 are to wear full-body protective equipment with proper resistance to acidic and chemical agents, as detailed in Document 2802-Alpha. Description: SCP-2802 is an anomalous form of life with a superficial resemblance to bird species of the subfamily Picinae (woodpeckers, piculets, and wrynecks). Specimens of SCP-2802 are completely externally identical to the Picinae species that they resemble. However, their internal anatomy is considerably divergent from any known vertebrate life form. Specimens of SCP-2802 lack traditional bony endoskeletons, instead possessing hydrostatic skeletons more reminiscent of those possessed by echinoderms (crinoids, sea cucumbers, starfish, etc.) than of any vertebrate organism. Several fluid-filled cavities located within the neck, torso, wings, and legs are surrounded by muscles that change shape and arrangement based on changes in fluid pressure, allowing for movement. In addition, the muscle tissue of SCP-2802 specimens is composed of cartilaginous cells that grant the boneless body additional structural support. Despite these skeletal and muscular differences, SCP-2802 movement is indistinguishable from non-anomalous Picinae movement patterns. 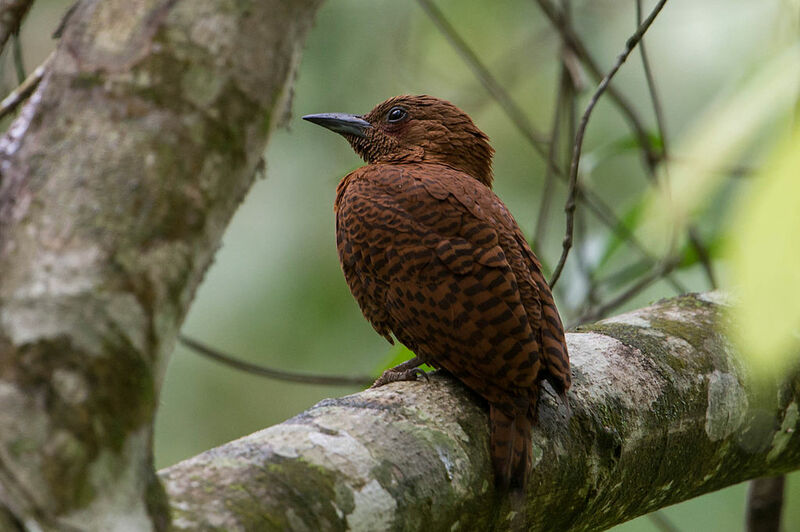 A specimen of SCP-2802 resembling a rufous woodpecker (Micropternus brachyurus). Photograph taken 5/20/2014. The SCP-2802 body cavity is occupied nearly entirely by a complex system of tough yet flexible rubbery tubes containing an acidic yellow fluid, primarily composed of fluoroboric acid (H3OBF4), sulfuric acid (H2SO4), and bromine trifluoride (BrF3). This singular organ system, known as the "monovascular system", seems to serve multiple purposes analogous to those of traditional vertebrate cardiovascular, digestive, nervous, and respiratory systems, carrying nutrients and electrical impulses throughout the body with the assistance of ten small multi-chambered heart-like "acid pumps" located at various points within the torso. The monovascular system appears to be more efficient than traditional vertebrate organ systems, transmitting electrical impulses more quickly and not producing any digestive waste. In addition, the unpleasant smell and potent corrosive nature of SCP-2802 internal acid deters predators from attacking or consuming wounded specimens of SCP-2802. The reproductive systems of SCP-2802 specimens are indistinguishable from those of the Picinae species said specimens resemble. A specimen of SCP-2802 is capable of breeding with non-anomalous specimens of the Picinae species it resembles, or with any other specimen of SCP-2802; for example, a specimen of SCP-2802 resembling a Hispaniolan woodpecker (Melanerpes striatus) can breed with a specimen of SCP-2802 resembling a black-rumped flameback (Dinopium benghalense) or with a non-anomalous specimen of M. striatus, but not with a non-anomalous specimen of D. benghalense. Eggs laid by participants in SCP-2802 breeding can hatch into specimens of either SCP-2802 or the non-anomalous parent species, with each egg laid having a roughly equal chance of either outcome. Behaviorally, specimens of SCP-2802 are largely identical to the Picinae species they resemble, feeding, nesting, migrating, and breeding in identical manners. However, specimens of SCP-2802 often show hostility to their own young, neglecting to feed their hatchlings, or occasionally simply pushing them out of the nest. Examinations of hostilely treated hatchlings indicate that specimens of SCP-2802 only treat their non-anomalous offspring this way, and raise SCP-2802 hatchlings as normal. Current observation indicates that, as of this writing, specimens of SCP-2802 comprise approximately ██ percent of the planet's woodpecker, piculet, and wryneck populations. 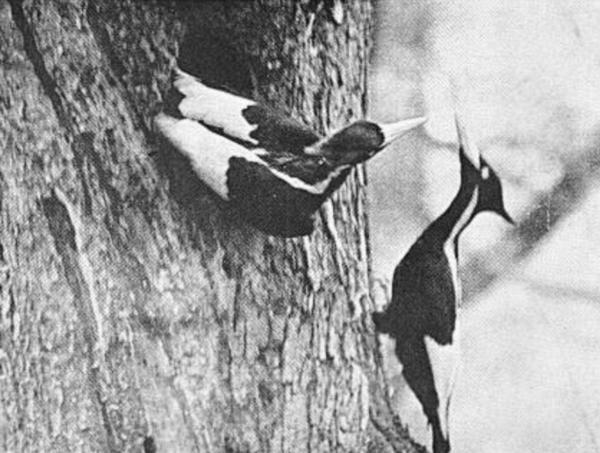 Two specimens of SCP-2802 resembling ivory-billed woodpeckers (Campephilus principalis). Photograph taken 4/10/1935. Discovery: SCP-2802 was discovered in 18██, when an ivory-billed woodpecker (Campephilus principalis) that had been shot for specimen collection purposes by naturalist ████ ███████ displayed anomalous internal anatomy. All C. principalis specimens collected by Foundation agents after this initial discovery displayed the same anatomy. After several living specimens were contained by the Foundation, a concerted effort to drive the wild population of SCP-2802 to extinction was undertaken, out of fear that SCP-2802 posed a threat to natural ecosystems or to humankind. SCP-2802 extinction efforts were believed to have succeeded, as all C. principalis sightings after the year 1948 have been unsubstantiated. SCP-2802 was classified as Neutralized until 1985, when additional Picinae species began exhibiting the same anomalous internal anatomy as the original C. principalis specimens. As no negative effects on natural ecosystems or human health could be conclusively proven to have been caused by the presence of SCP-2802, the current band-tracking program was initiated to determine the movement patterns of SCP-2802 in comparison to non-anomalous Picinae and their effects on their environments, if any. On 8/14/████, a captured specimen of SCP-2802 attacked containment personnel by expelling streams of its internal acid through specialized ventricles resembling tear ducts. Three staff members suffered chemical burns, but no fatalities resulted. The SCP-2802 specimen was placed in isolated containment for testing purposes. Examinations of captive SCP-2802 specimens revealed no trace of such defensive organs. Since Incident 2802-1, ████ specimens of SCP-2802 have possessed defensive organs of some type, with the possessive portion of the population rising to ██% within the last █ years. Containment procedures have been updated accordingly to provide proper protection to SCP-2802's possible defensive measures.